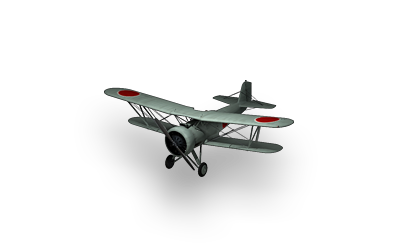 The Nakajima Type-91 is a tier I Japanese fighter. It was built as a prototype to a request from the army, and it first flew in 1931. It became obsolete in 1936 with the coming of the Kawasaki Army Type 95 Fighter. 420 planes were built from 1931-1934. Desarrollado a petición del Ejército Imperial Japonés en cooperación con ingenieros aeronáuticos franceses. Almost all LTH pretty average: speed and agility is slightly worse than the American counterpart, but better weapons. The best indicator of the speed of the roll, an order of magnitude better than other start aircraft - 111 degrees per second. Pretty fast and maneuverable aircraft, with good speed roll that allows you to quickly turn the barrels and other complex shapes. That provides greater potential in a dogfight as dodging enemy fire and attack from the front, followed by entering the tail and counterattack. In many respects, the aircraft still quite low, knocked out, only a small number of strength, only 60 units, so the game on this unit must be careful, as in the following on any Japanese plane. Use maneuvers, do not go to frontal attacks, or in the first row, and then you will succeed. Designed in response to an Army requirement of 1927, the Type 91 was developed from the NC series of fighter prototypes. The prototype was the sixth machine under that designation but was a fundamentally distinct airframe design. Compared to the earlier NC, the Type 91 had a smaller wing, relocated fuel tank and wing-bracing struts, Townend ring-type cowling, new design tail and undercarriage. It first flew in 1931. 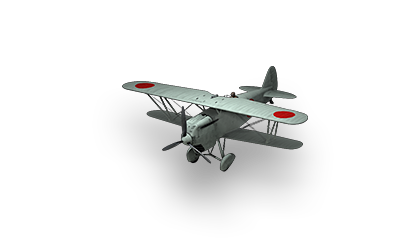 The Army ordered the new aircraft as the Nakajima Army Type 91 Fighter and the first deliveries took place late in 1931. However, issues arose with both directional stability and centre of gravity, with the result that the type was delayed entering service. Between 1931 and 1934, 420 aircraft were constructed (including 100 by Ishikawajima; 23 of the total were Type 91-2, powered by a 432 kW (580 hp) Nakajima Kotobuki 2 radial engine. This version first flew in July 1934. The Type 91 was supplanted in service by the Kawasaki Army Type 95 Fighter in 1936-7.